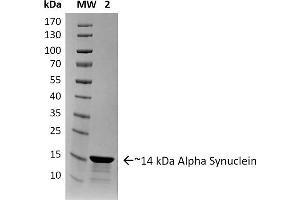 SDS-PAGE of ~14 kDa Human Recombinant Alpha Synuclein Protein Aggregate (Control) . Lane 1: Molecular Weight Ladder (MW). Lane 2: Alpha Synuclein Protein Aggregate . 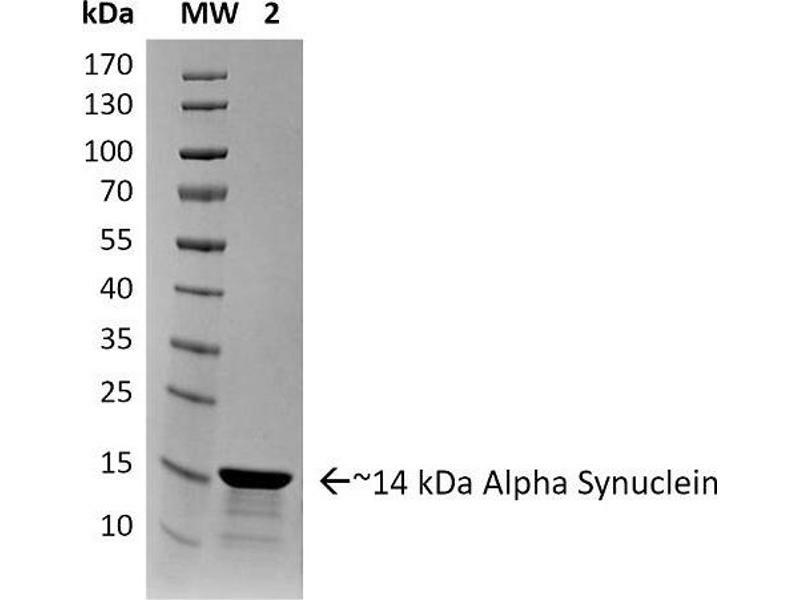 Primary rat hippocampal neurons show lewy body inclusion formation when treated with active Alpha Synuclein Protein Aggregate at 4 µg/ml (D-F), but not when treated with control Alpha Synuclein Protein Aggregate at 4 µg/ml (A-C). Tissue: Primary hippocampal neurons. Species: Sprague-Dawley rat. Fixation: 4% formaldehyde made from PFA. 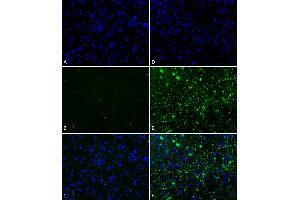 Primary Antibody: Mouse anti-pSer129 Antibody at 1:1000 24 hours at 4°C. Secondary Antibody: FITC Goat Anti-Mouse (green) at 1:700 for 1 hours at RT. Counterstain: Hoechst (blue) nuclear stain at 1:4000 for 1 hour at RT. Localization: Lewy body incluscions. Magnification: 20x. Active alpha synuclein aggregate seeds the formation of new alpha Synuclein aggregates from the pool of active alpha Synuclein monomers . Thioflavin T is a fluorescent dye that binds to beta sheet-rich structures, such as those in alpha Synuclein aggregates. Upon binding, the emission spectrum of the dye experiences a red-shift, and increased fluorescence intensity. 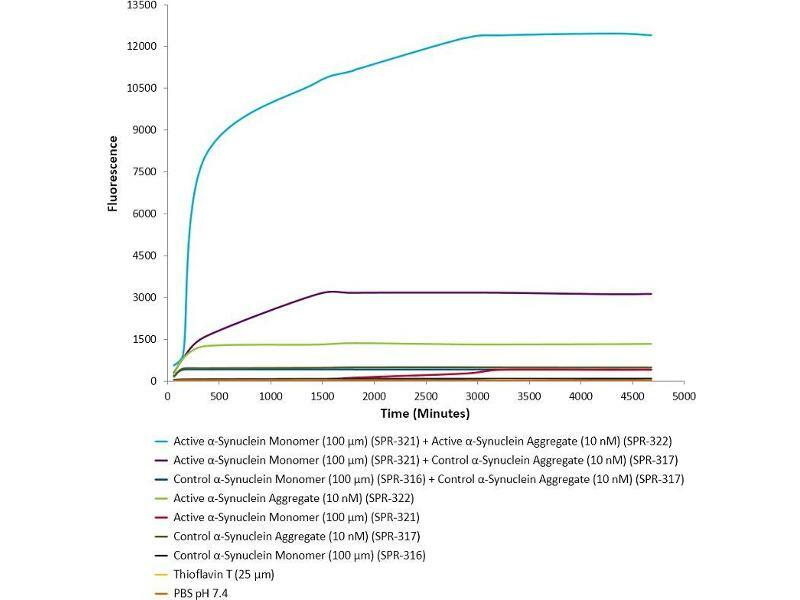 Thioflavin T emission curves show increased fluorescence (correlated to alpha Synuclein protein aggregation) over time when 10 nM of active alpha Synuclein aggregate is combined with 100 µM of active alpha Synuclein monomer , as compared to when 100 µM of active alpha Synuclein monomer is combined with 10 nM of control alpha Synuclein aggregate , or 100 µM of control alpha Synuclein monomer is combined with 10 nM of control alpha Synuclein aggregate . 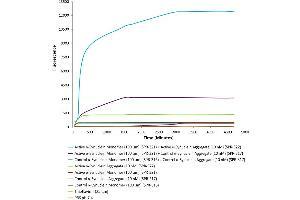 Thioflavin T ex = 450 nm, em = 485 nm. Purity 92% pure using SDS-PAGE analysis. Background Alpha-Synuclein (SNCA) is expressed predominantly in the brain, where it is concentrated in presynaptic nerve terminals (1). Alpha-synuclein is highly expressed in the mitochondria of the olfactory bulb, hippocampus, striatum and thalamus (2). Functionally, it has been shown to significantly interact with tubulin (3), and may serve as a potential microtubule-associated protein. It has also been found to be essential for normal development of the cognitive functions, inactivation may lead to impaired spatial learning and working memory (4). 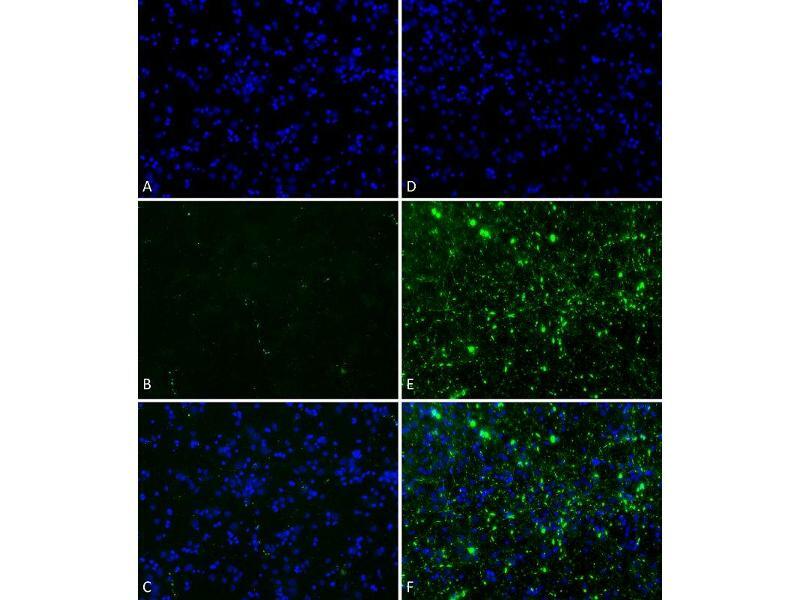 SNCA fibrillar aggregates represent the major non A-beta component of Alzheimers disease amyloid plaque, and a major component of Lewy body inclusions, and Parkinson's disease. Parkinson's disease (PD) is a common neurodegenerative disorder characterized by the progressive accumulation in selected neurons of protein inclusions containing alpha-synuclein and ubiquitin (5, 6). 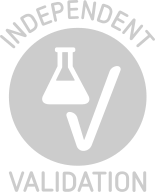 Certified 92% pure using SDS-PAGE analysis.